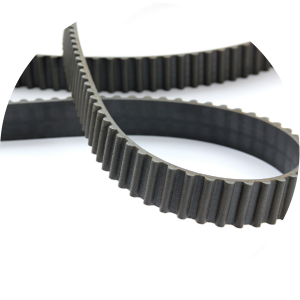 Black Bear opportunity: Increase transmission belt efficiency by reducing hysteresis and improve flex fatigue whilst maintaining or increasing mechanical performance or increasing mechanical performance. Our carbon blacks provide unique properties to enhance the reliability, durability and environmental performance of your transmission belts. 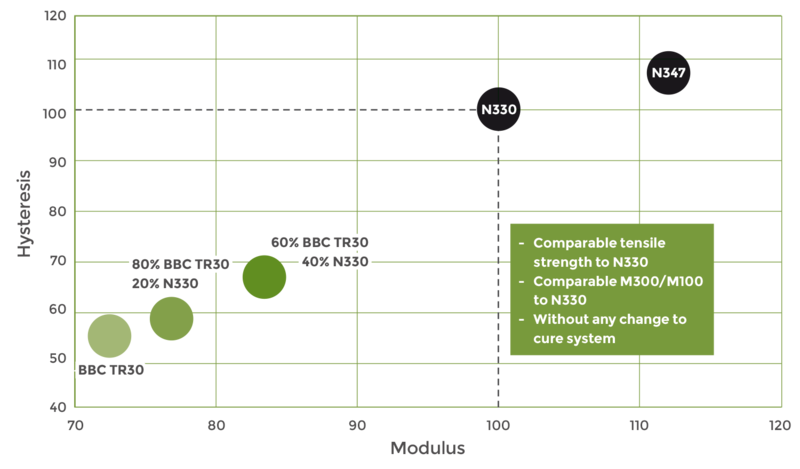 Replacement of ASTM N200/300 by BBC TR30 will improve dynamic reinforcement properties. Replacing N550/N772 will give better mechanical properties as well as enhanced dynamic performance. Higher building tack was observed in a SBR bonding application compound which will benefit inter-ply adhesion. Generally, high reinforcing blacks (N100 – N300) are used in rubber compounds in order to ensure good mechanical performance – tensile properties, wear resistance, cut and tear resistance. The downside of these kind of carbon blacks is their poor dynamic performances. Black Bear’s carbon blacks uniquely combine good mechanical and dynamic properties (see figure on the right).